Kloochy Creek Spruce, originally uploaded by atul666. The national co-champion Sitka Spruce tree split and broke off about 80ft off the ground in a recent storm (Dec. 2, 2007). At 204 feet tall it was the tallest Sitka Spruce in North America and a co-champion with the Sitka Spruce of the Quinault National Forest (see previous post). 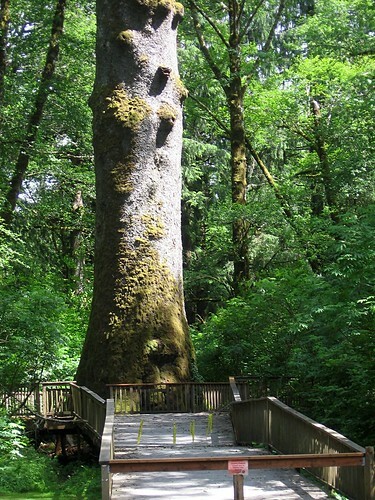 Located just of Hwy 26 between Portland and Seaside the giant tree was a popular attraction visited by more than 100,000 people each year. The tree had been weakening of late and forestry officials knew that it was coming to and end when a large section of the tree was knocked off in a storm revealing a rotted interior. 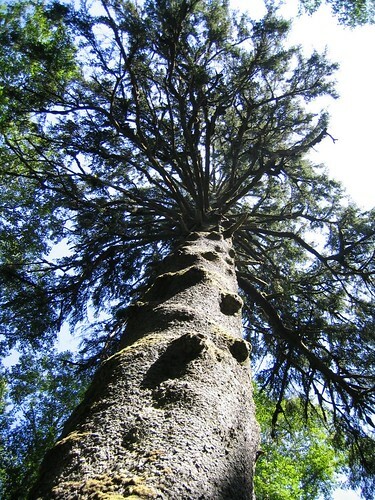 Largest Sitka Spruce in the USA, originally uploaded by ukslim.